“I’m with you,” she said. “I have to be careful. I have responsibilities—I’m a dog owner.” Her words warmed my heart. She described my situation exactly. There is one being on this planet who depends on me, and he is a toy poodle. I won’t say he’s my toy poodle; we share our lives, Chou Chou and I.
It’s a special relationship. Around the house, we have distinct responsibilities. I take care of our food, pay our rent and utilities—the ordinary things. Chou Chou offers protection. He sits at the bathroom door while I shower in the morning. He barks whenever our next-door neighbor gets in or out of his car. He welcomes anyone who comes the door—and continues welcoming them, with enthusiasm, until they have said hello to him. He takes me out for walks every day, which, on my own, I would never do. He retrieves balls that I throw. And most importantly, he greets me, literally jumping up and down, every time I come home—no matter how unhappy he was when I left without him. Chou Chou never holds a grudge. He and I go way back. In 2003, Chou Chou was my mother’s dog, the last of a long line of Mom’s toy poodles. Mom had a real thing about toy poodles. My father once said that if he had to be reincarnated, he wanted to come back as my mother’s dog. He was only half kidding. After he died, of course, Mom’s dogs were even more important to her. When the toy poodle that Dad had given her died, my brother bought her Chou Chou. I was coming visit quite a lot then, and the dog and I got along famously. One day on a walk, and we ended up at a golf course. Fortunately, no one was around because Chou Chou went berserk on the green. He put the side of his face down on the grass and ran as fast as his four legs would go—first one side of his face, then the other, and then he flipped over and rolled in the grass. Also, I think I petted him more, or better, than Mom did because when I was there, he was my dog. Mom died less than a year later, and I wasn’t living in a place where I could have a dog, so Chou Chou went to my brother. Geoff did teach Chou Chou one trick—an unusual martial-art style rear kick—but after six years my brother died, and I was then able to take Chou Chou. Gladly. The first time we went for a walk at South Whidbey Community Park, when we got to the soccer field by the forest, Chou Chou saw that stretch of bright green and went berserk. He was running and rolling like a puppy, so excited to be back in the grass again. “He can’t help it,” I said. “He’s French.” The truth is that Chou Chou does not like to be smelled. 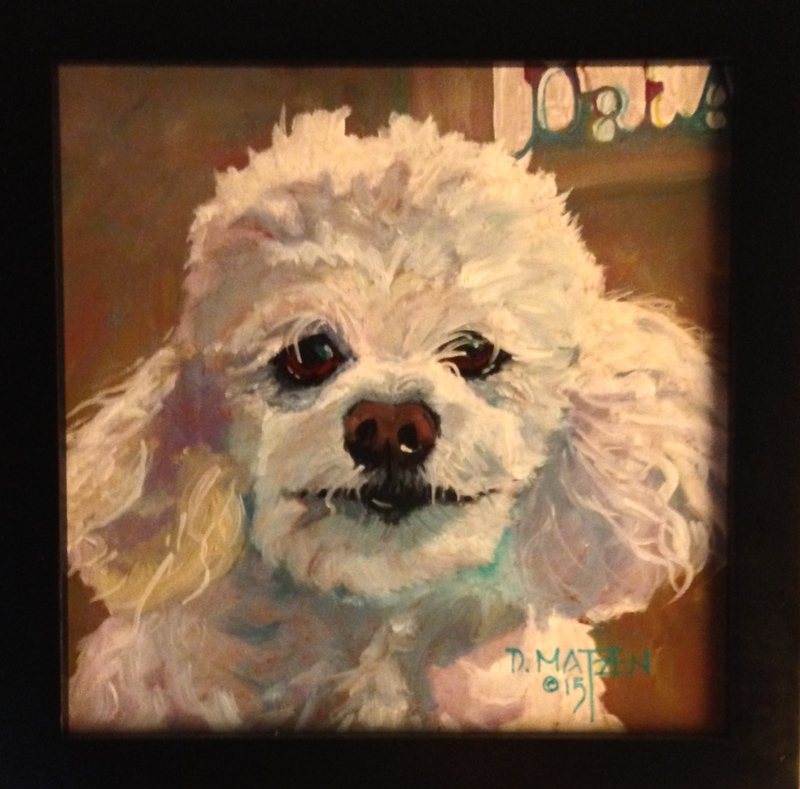 I work as an editor and writing coach, and two of the people I’ve assisted in the last five years were talented artists who paid me “in kind”—both of them with paintings of my beloved dog. 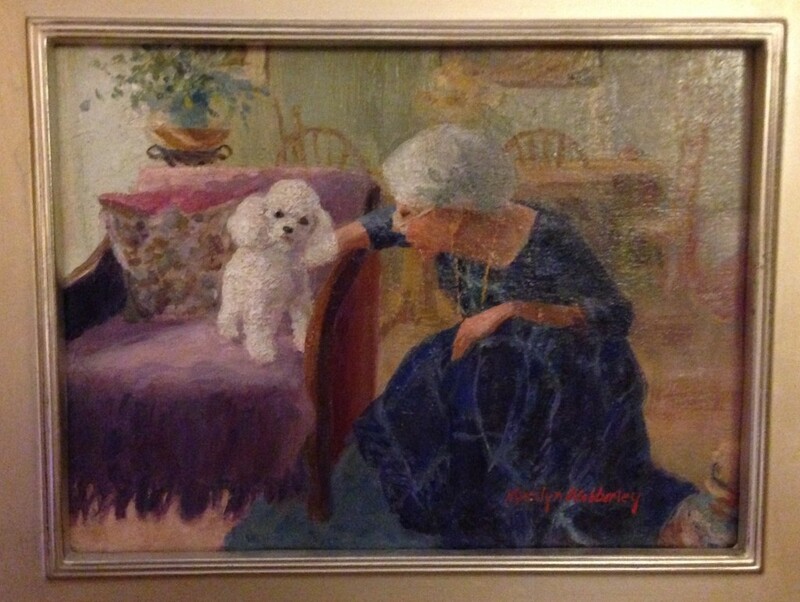 I like to point out that not many people have their likeness in an oil painting, and I live with a dog who has not one portrait but two! Chou Chou has been wonderful company, but this may not be for much longer. Last spring as I was meditating I heard an inner voice say, This is my last summer. It was an intuitive leap, but I figured this message came from Chou Chou, who was lying beside me in that moment. The summer is over now, and he has a cough. It’s a typical ailment for toy poodles, who were over-designed and have the problem of a collapsing trachea, which becomes more pronounced as they age. At one point a few weeks ago, the cough was so bad that I thought, Oh no. Is it time? So, we’re in a liminal space, this toy poodle and I. Of course, none of this may be real. Chou Chou has never before spoken to me. I don’t know if this was truly him, and if it was, I don’t know that he knows for sure the timing of his departure. But I do feel taken care of in this. I’m treasuring the time we have together now. If Chou Chou does go in a month, I will feel I was warned. And if he doesn’t, I’ll be very happy to continue being with him for whatever finite time remains to us. Margaret, I loved your tribute to Chou Chou (and the portraits!) And I found myself tearing up at the end even though I am not really that much of dog person. I am sending this to a friend of mine who has a dog very much like yours, and who feels the same way about her little bichon as you feel about Chou Chou. Merry Christmas to you both. This is a wonderful story, Margaret, and touchingly told. Thank you.